Captain Eva Innocente and the crew of La Sirena Negra cruise the galaxy delivering small cargo for even smaller profits. 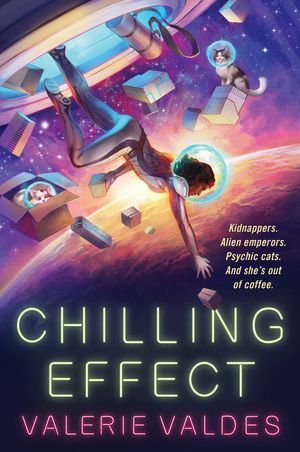 When her sister Mari is kidnapped by The Fridge, a shadowy syndicate that holds people hostage in cryostasis, Eva must undergo a series of unpleasant, dangerous missions to pay the ransom. But Eva may lose her mind before she can raise the money. The ship’s hold is full of psychic cats, an amorous fish-faced emperor wants her dead after she rejects his advances, and her sweet engineer is giving her a pesky case of feelings. The worse things get, the more she lies, raising suspicions and testing her loyalty to her found family. To free her sister, Eva will risk everything: her crew, her ship, and the life she’s built on the ashes of her past misdeeds. But when the dominoes start to fall and she finds the real threat is greater than she imagined, she must decide whether to play it cool or burn it all down.